Kelli Nina Perkins: What the F.O. K.? 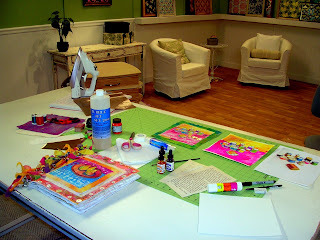 Here are some of my things set out for the Quilting Arts Workshop I just taped on Stitch Imagery from photos. My funny story is this...we try to tape in one fell swoop, so you'll see me trip over my words quite a bit. Is it a sewing machine or an iron? Jeez. There are no cue cards or prompts except for the camera guy holding up the occasional time card, so you have to memorize your steps. During the last segment of my workshop camera man Billy suddenly got a buzz in his ear from the Director, so he wrote me a special card and held it up. It said "F O K." I kid you not. I was trying to keep going while I pondered this...what could it mean? I finally decided that my "F" was "ok", though I had no idea what the "f" was, so I just ignored it. He seemed pretty insistent about it however. Lol. I must look pretty strange in that segment, since I nearly came to a halt. When we were done with the taping I asked him to hold up the sign and everyone started laughing. He apparently wrote "FOIL" because I had forgotten the foiling step, but the "L" was sideways and it sure looked like FOK! Fortunately, I remembered the foil at the last minute on my own. What a crazy day! I think I would have come to a complete stand still - laughing out loud with my head on the table! Amazing you kept going - and great for a laugh! I really do think they need to post out-takes! I can't wait to see your DVD!